Please refer to our stock # 50339 when inquiring. 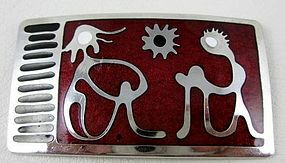 This great modernist pin was made by the Canadian duo of Micheline de Passille and Yves Sylvestre. It is made from chrome plated metal with a black, white, and burgundy enamel front. It does have some surface wear on the left figure, but it does not detract from the piece. Overall, it is in good condition and the reverse is signed "de Passille-Sylvestri".